We are an independent Dartmoor art gallery representing the very best of the South West’s professional artisans. Specialising in quality original art in a variety of media inspired by the South West . We offer whole day, half day workshops and regular weekly classes in a variety mediums from drawing to felting run by professional, experienced artists. We will help you to choose the best mounts and frames for your art before sending off to our framers, who will deliver it back all framed and ready to hang. Our exhibitions celebrate the seasons. Each Exhibition has a preview evening where many artists are on hand to discuss their art work. Wildwood will work with you and/or your interior designer to find the right quality artwork that suits the right space, you, your home and family. We offer local businesses the opportunity to hire artwork and will change it periodically for you. We are located in the beautiful Walkham Valley on Dartmoor in a pretty village called Horrabridge. 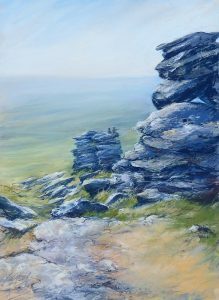 Wildwood celebrates the wealth of incredibly talented artisans here on Dartmoor and is a showcase for their high-quality art inspired by Dartmoor and the British countryside.